Fun things have been happening around my house!!! Thanksgiving is over and I've gathered up my fall decorations, packed them away... and am now working on my Christmas decorating! I haven't seen or opened many of these boxes in years! It's like Christmas morning as I unwrap everything. You see... since having the Olde Green Cupboard for so many years... and decorating for Christmas... by the time I got to my house - I was DONE!! I can't even tell you how many years I didn't even put up a tree. I'm not a scrooge... but was just tired! However, this year is different. Below you will see some of the areas I have finished. But first... look at my two new wonderful pieces!! You see... 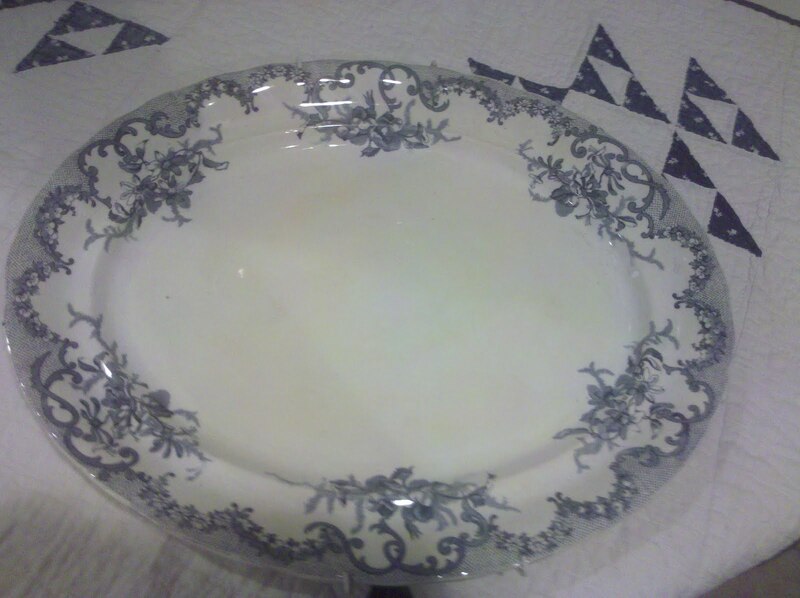 I am also a lover of blue transfer ware platters... look at my two new ones! The one on top has sweet little birds! The one below my friend Kelly found for me while shopping at Mt. Dora! They will look smashing in my quilting studio. I have it decorated with my blue transfer ware collection and my children's antique chalk slates (another silly thing I collect)! 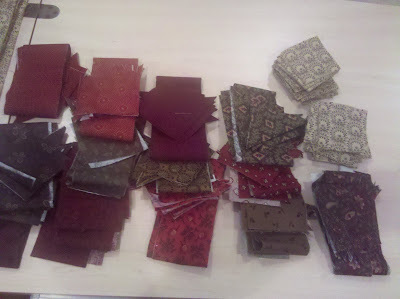 This isn't a very good picture... but I wanted you to get the color palette of my project for the new magazine "Primitive Quilts and Projects". It's debut issue will be April 2011. The 3 gals that are the heartbeat of the magazine are all sisters! They are super, great gals. We had so much fun with them at market! They've asked tons of primitive designers to submit their quilt and/or project by January 21. From the entries they receive, they will pick 15 for the first magazine. Heather is also sending in one of her wonderful mohair creations. So... keep your fingers crossed, say a prayer for us... that we get chosen! There is stiff competition that's for sure! As my quilt progresses... I'll give you a few sneak peaks! My Santa's wanted to say "HI!" to everyone! The primitive look...that's what I love!!! The more grungy looking the better!! 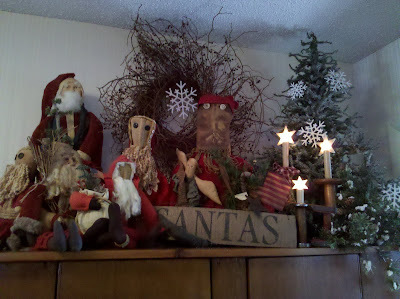 My favorite Santa's are from Alta's Heirlooms. I have had them for quite awhile... I wonder if she still makes them? I'll have to check into that and see. She was always at our gift market in Pennsylvania. She and her husband used to make them together. They have the most wonderful sculpted faces! Ok... I just checked and she is still making her Santa's. Go to this link and you'll be so surprised. She also makes wonderful ornaments and bears!! http://altasheirlooms.com/ They are a bit on the pricey side... but trust me... worth every penny! More of my little friends. What's up with all my dolls and Santa's? As I was digging everything out of their boxes... I giggled... maybe I didn't get to play with dolls enough when I was little and that's why I'm still so attracted to them.... ya think?... I'm just sayin' !! Oh who cares... I love them and that's that! 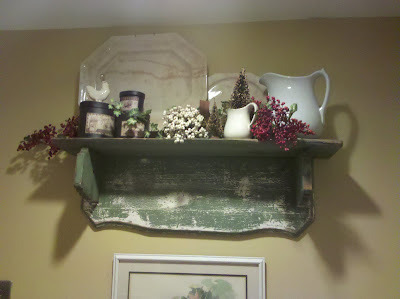 I love to decorate all over the house... this is in my kitchen. 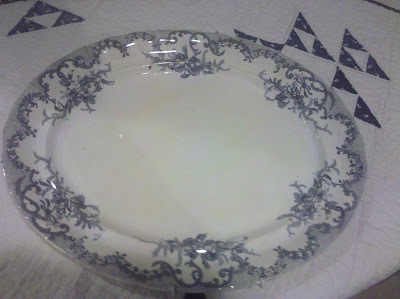 I'm a lover of ironstone... pitchers, platters, plates... you name it.. I love it. The more patina the pieces have on them the better I like them. The middle section with the little white bundle... that's from my "popcorn" tree. It bloomed one time in over 12 years... this is all I got out of it!!! I treasure these little fellows! Every year after this blooming time... the popcorn was black... you know... the look you get when you leave your popping bag in the microwave too long? Wheeewwwoooo... stinky! I also love to take bottle brush trees and put them in pitchers... they look just like it grew there. My little black boxes are reproductions of holiday cocoa, tea, etc. Too cute!! It's time to heat up those turkey leftovers! They are so good....!!! 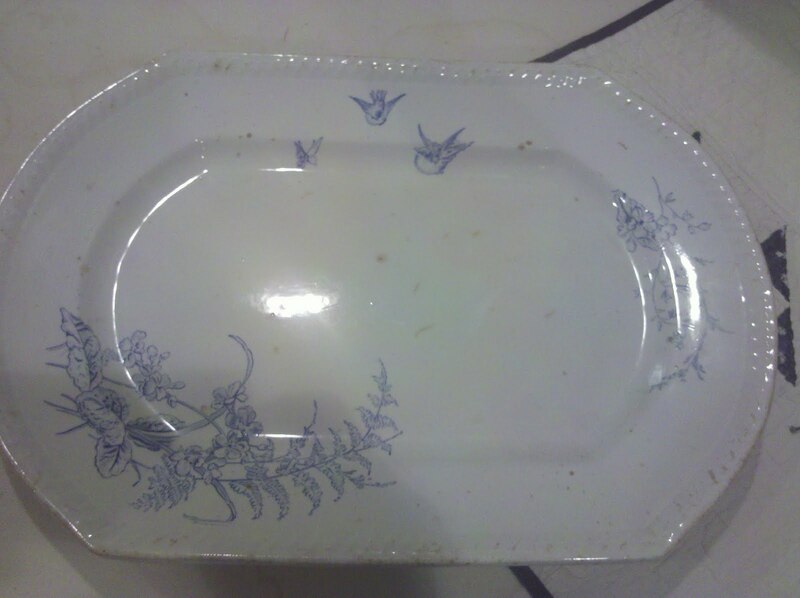 That's the best part of Thanksgiving.. those days of eating what's left. Let's see... the fudge is all gone, the pumpkin pie is all gone, no more stuffing, no more deviled eggs, boo hoo.... I guess it's back to the normal meals! Hey... how come we don't fix turkey more than twice a year? Isn't that silly? I think I'll have to just make that happen... cook gobble, gobble more than twice! What a novel idea. 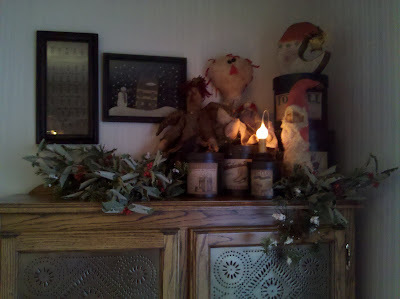 It's now on to my sewing machine... the Christmas decorating will be worked on more tomorrow! I'll send you more photos.